Collecting four leaf clover is a truly ancient form of magic for luck. It is said that the chances are 10,000 to 1 to find one, but I know this depends on where you are looking. In some places, four leaf clover is far more common, and in others, you can search all day and never find your lucky clover! Still, the very fact that you are "looking out for luck" and time spent with nature is always a good thing. This is why my 90 year old East Prussian great aunt would go out each Sunday after church to find four leaf clovers. She would bring them home, dry them between the pages of her bible - and then, and she never told anyone else but me, she would crumble them up and put them into stews and soups so that her loved ones would eat good luck at her table. • The First Leaf is for LOVE. • The Second Leaf is for GLORY. • The Third Leaf is for FORTUNE. • The Fourth Leaf is for HEALTH. ... that's what is said traditionally, but you can choose your own positives. I once created a four leaf clover logo made from four hearts. 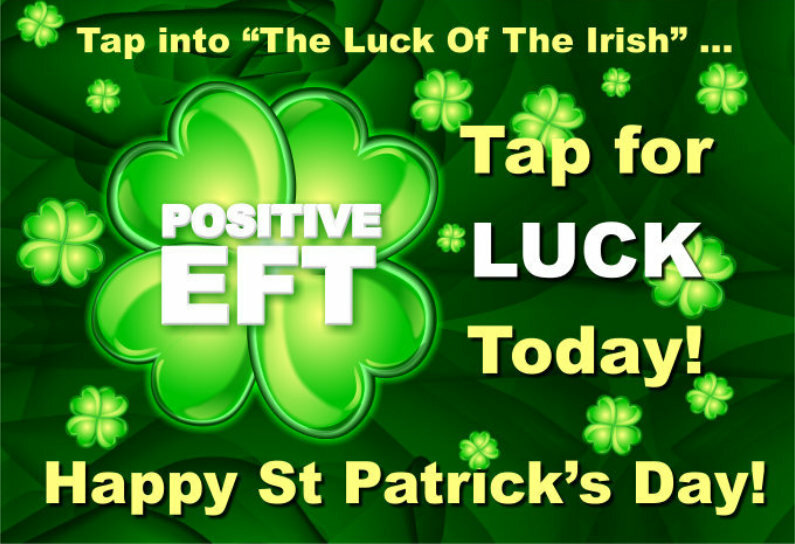 This was the feature image for Positive EFT (Positive Modern Energy Tapping) book. You can get the book here - then you can learn to do modern energy tapping for love, luck, health, money and more and raise your energy, your mood and your power for magic. Let's get back to the four leaf clover as a luck charm. We have established that you can collect, dry and then sprinkle four leaf clover on your food. What else can we do with our lucky clover? Well, we can certainly make magic luck charms we can wear. There is a company that specialises in this - finding four leaf clover, encapsulating it in resin and turning it into lucky jewelry. Nice! 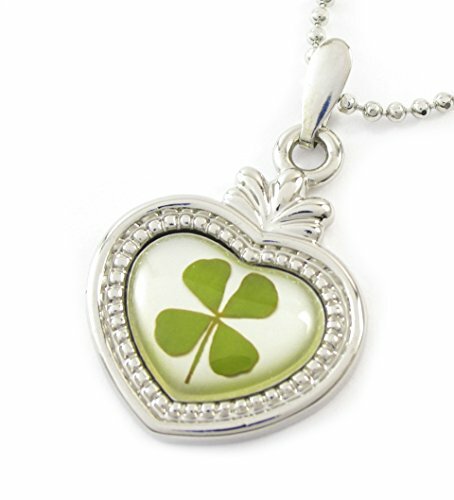 See more examples of Four Leaf Clover charms here. Lots of magical people like to make their own resin charms, so that's a great idea for DIY magic production. 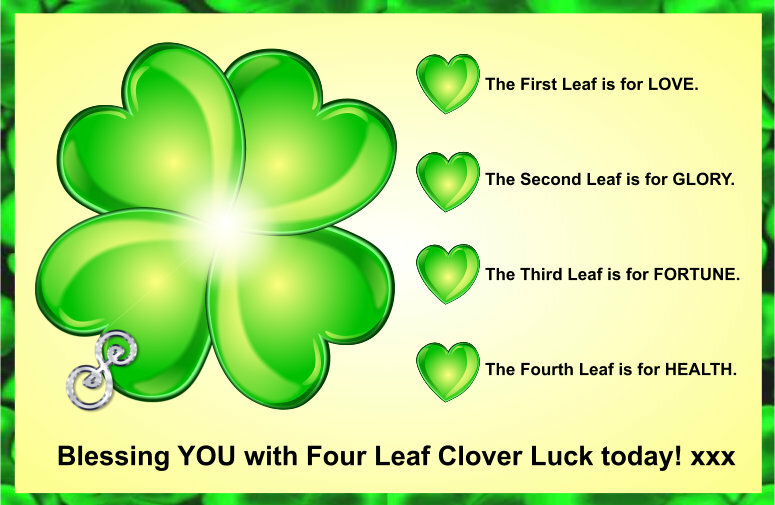 You can also put your lucky clover into a locket, or go really old fashioned and create a shaman's pouch in which our four leaf clover can be an ingredient. If you make magic potions, add a sprinkle of good luck to your endeavours. Although clover is edible, if you want just the energy of the clover, you can stand an energy magic potion on your clover for a night and a day (in sun and in moon) to absorb the energy. All of this relies on you going out and finding your own four leaf clover. I appreciate that in this day and age, many of us are far too busy to stare at the constantly dinging and binging mobile phones to every get into the trancey state involved in seeking out the rare four leaf clover in a whole field of them. Still, let's cheer up! 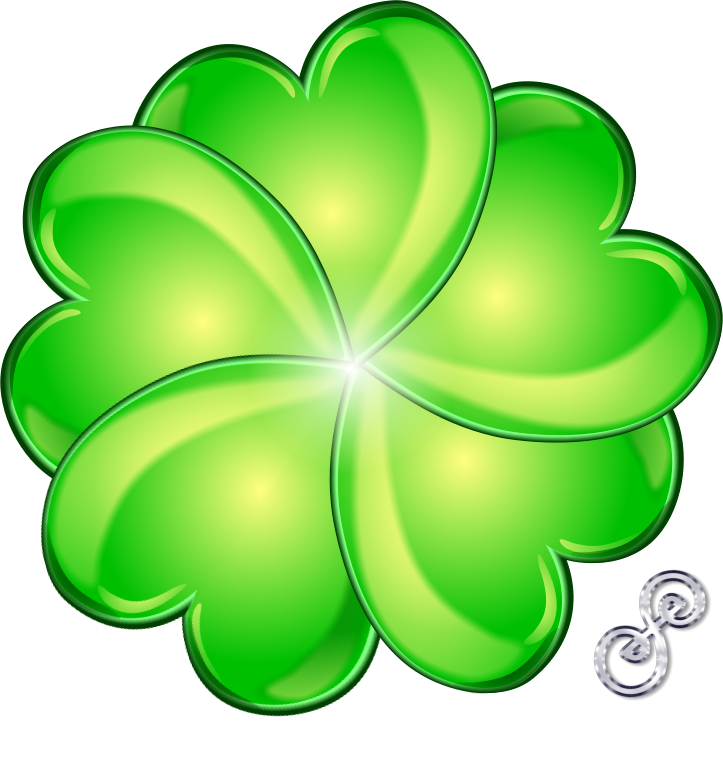 You can evoke fresh, healthy, nutritious, delicious, lucky four leaf clover energy by drawing or painting green clovers on to many surfaces, sticking a few little clovers on your website, or going shopping for clover stuff on St Patrick's day! One more thing - you can draw the four leaf clover, using my heart design, into the air. It's a lovely energy raiser you can do quite small just with your fingers, or really big with your whole body. Please start looking out for patches of clover to see if you can find some real four leaf clover for yourself. It is lovely, so magical, and connects you with all the magical people who have done the same thing since the dawn of humanity and the beginnings of magic. 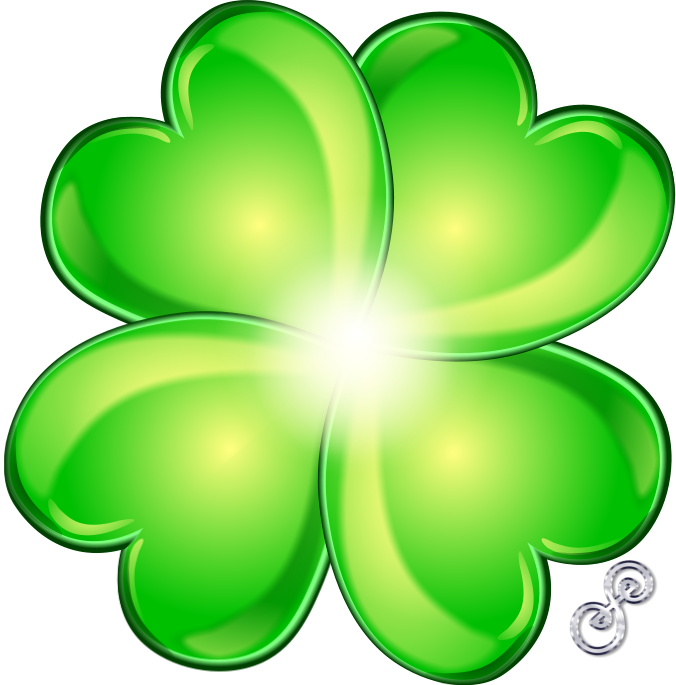 Looking for luck, believing in luck, tapping for luck and generally making the full on intention that you are ready to receive far more luck than you've ever had before is a REALLY GOOD THING to be doing! Spread the four leaf clovers! To find a five leaf clover is said to be the luckiest of them all, a one in a million chance.